Whether your 21st birthday bash takes place at a house, bar, on a boat, or in a specially rented function hall, there are certain traditions which can be included in any form of celebration. This article contains a selection of these. Speeches are a core part of many 21st birthday celebrations. These can range from embarrassing childhood moments (or ones from more recently! ), to special achievements, to twenty special moments – one from each year of the birthday guy or girl’s life. It is usually family and close friends who make the speeches, and it could be arranged that each person picks a separate theme (for example it may be more likely that a close friend or sibling wants to talk about embarrassing moments, where as the parents are more likely to want to mention their son or daughter’s achievements). When planning your speech, make sure to stick to events that are going to be memorable, yet not so embarrassing to the person whose birthday it is that it won’t be funny, though funny stories are always a guaranteed crowd pleaser if there are a lot of people in attendance. Also remember to stick to the story and not stray off topic, as this is not interesting to those who weren’t there. It is also a good idea to have a range of people speaking (though probably not more than five or six) so that all aspects of the person’s life are covered; from diapers to college. A photo collage or slideshow of pictures is guaranteed to entertain at any 21st. There are many ways photos can be presented – you can create a collage of baby pictures, a timeline of photos throughout the person’s life, a selection of important moments or memorable moments projected in a slideshow. A slideshow works particularly well if the celebration takes place in a large space and there is a screen or wall where pictures can be projected throughout the party. If you are in a restaurant or smaller venue, then a collage is probably better. If at home, home videos (particularly baby ones) also make for entertaining viewing. 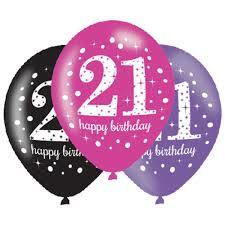 There are various activities or games which are suitable for 21st birthdays. An ever-popular one is someone asking 21 true or false questions, with the birthday guy or girl drinking a shot for each statement that is true (shots can also be substituted for eating something really sweet or sour or any other action desired). Another idea is the presentation of 21 gag gifts that the person may ‘need’ in life, for example underwear, handcuffs, a ‘ for Dummies’ book and anything else that may pertain specifically to the person celebrating. If it is not too large a gathering, typical child’s party games can also be adapted to fit an adult crowd. Piñatas and limbo are two which can still be fun for all ages. A ‘remember when’ type of game can also be played, where everyone takes turns in retelling (maybe in five sentences or less) their most memorable moment of the of the birthday guy/girl. Whichever celebratory ideas you choose for your 21st (or whoever’s planning it chooses), make sure all the planning is done beforehand and everything is prepared, and you should have a magical and memorable birthday.